No student plans to include mental illness in their university curriculum but the onset of serious illness often happens during these years of young adulthood. I learned this from firsthand experience and I want to prevent you from going down the path I did. I arrived at McMaster as a varsity athlete and Ontario Scholar and I encountered debilitating challenges along the way. But, I successfully completed two degrees and went on to graduate school. I want to share the strategies I used in order to be successful in higher education and assist those who may be looking for guidance in order to have the best experience during their time at McMaster. Unfortunately there is still a stigma against mental illness, I am omitting my name from this article because as I finish graduate school I don’t want a future employer to discriminate against me because of my health challenges. This is the wisdom I learned from my personal experiences from completing multiple degrees at McMaster, while also overcoming multiple onsets of mental and physical health issues that could have kept me out of post-secondary school. For the average student, our marks will drop in first year by comparison to marks we earned during high school. First year is the time to try new things, meet new people, and get involved in campus life. Your course work is not as heavy as in later years. This is the best time to learn how to be a successful student. Generally speaking, you just need to pass first year. This may be different for entry into professional programs. I recommend aiming for a B average by the end of your second year. Your professors are there to help you succeed. Reach out to your TA’s to talk about course work, in some cases they are the ones who will grade you. TA’s will also remember you making the effort to speak with them about the course. Life is challenging at university when you are mentally well; and harder when you are mentally struggling. Learning to be a successful student will overall improve academics and reduce stress. Be sure to do the readings before class, start your papers early, and meet with the TA and prof when possible. This displays your interest in their course and you will receive feedback about your progress. The combination of how you spend your time, and the people you spend your time with, will have a direct correlation with your successes in life. Find friends with common interests and passions. These include: sports, hobbies, culture, volunteer opportunities, etc. Hang out with driven, positive, and kind people. This will translate into productive conversation, sustained learning, and good study habits. Develop your work ethic through creating opportunities for yourself: volunteer, get a job, internship, take on a thesis. I strongly advise making friends with people in your program as they will help and support you by studying together and being available when questions arise. How you spend your free time is up to you, but I caution you about how you manage your lifestyle. It’s important as a student to manage a healthy lifestyle and stress. Your goal should be to prevent stressors in your life! Some ideas I recommend: prioritize and schedule physical activity in your week, eat regularly, and get the sleep you need to function at your best. (For people in their teens an ideal sleep schedule requires 9 hours of each night.) Sacrificing sleep for marks does not always work. If you miss some sleep a nap may be necessary. Eating a nutritious diet is also important. You can’t eat too many vegetables and fruits and you do need protein, especially if you do not eat meat. Healthy eating will help prevent weight gain. Food choice is not just a financial decision. It is helpful, and economical, to bring healthy snacks to campus. Be in control of substance use. Binge drinking and other drugs have huge consequences on mental and physical health. You can drink moderately and still get work done. Caffeine and other drugs, such as cannabis, also require discipline by creating limits because substances can impair your ability to think. In fact, discipline in everything you do will produce improved quality of life. Heavy drug use can impact your achievements in school, sport, health, friends, and money. Remember to put school first because you are paying to be here! Be aware of the economics of your lifestyle, including food, travel, social costs, tuition, books and tutors. Know your budget and stay within it. If you do acquire mental illness symptoms while at university, like I did, get the help you need. Symptoms of anxiety and depression are common to all students. If your symptoms persist beyond two weeks and it begins to impair your ability to function then you may need to seek professional help. Serious mental illness can first show up during young adulthood. This is more likely to occur if you have substance abuse and other unhealthy habits in your lifestyle. If serious mental illness occurs, you can still be successful at university. Mental illness may, in some cases, require professional help, reduced course load, or taking a break from school to get back on your feet. Your likelihood of succeeding as a student is greater if you seek the help and support you need. There is no shame in reducing course load and taking your time to be successful. Start with your peers. There are peer services available. Ask your friends for direction. Speak with your family. A difficult time is easier with family support. Discuss academic progress with Academic Advisors. Accommodations through Student Accessibility Services may be indicated. Seek self-help guidance by using call lines and reliable websites. Find professional counselling or see your doctor. This is the gateway to more specialized care. No student plans to include mental illness in their university curriculum but the onset of serious illness often happens during these years of young adulthood. I learned this from firsthand experience and I want to prevent you from going down the path I did. I arrived at McMaster as a varsity athlete and Ontario Scholar and I encountered debilitating challenges along the way. But, I successfully completed two degrees and went on to graduate school. I want to share the strategies I used in order to be successful in higher education and assist those who may be looking for guidance in order to have the best experience during their time at McMaster. Unfortunately there is still a stigma against mental illness, I am omitting my name from this article because as I finish graduate school I don't want a future employer to discriminate against me because of my health challenges. This is the wisdom I learned from my personal experiences from completing multiple degrees at McMaster, while also overcoming multiple onsets of mental and physical health issues that could have kept me out of post-secondary school. For the average student, our marks will drop in first year by comparison to marks we earned during high school. First year is the time to try new things, meet new people, and get involved in campus life. Your course work is not as heavy as in later years. This is the best time to learn how to be a successful student. Generally speaking, you just need to pass first year. This may be different for entry into professional programs. I recommend aiming for a B average by the end of your second year. Your professors are there to help you succeed. Reach out to your TA’s to talk about course work, in some cases they are the ones who will grade you. TA's will also remember you making the effort to speak with them about the course. Life is challenging at university when you are mentally well; and harder when you are mentally struggling. Learning to be a successful student will overall improve academics and reduce stress. Be sure to do the readings before class, start your papers early, and meet with the TA and prof when possible. This displays your interest in their course and you will receive feedback about your progress. The combination of how you spend your time, and the people you spend your time with, will have a direct correlation with your successes in life. Find friends with common interests and passions. These include: sports, hobbies, culture, volunteer opportunities, etc. Hang out with driven, positive, and kind people. This will translate into productive conversation, sustained learning, and good study habits. Develop your work ethic through creating opportunities for yourself: volunteer, get a job, internship, take on a thesis. I strongly advise making friends with people in your program as they will help and support you by studying together and being available when questions arise. How you spend your free time is up to you, but I caution you about how you manage your lifestyle. It’s important as a student to manage a healthy lifestyle and stress. Your goal should be to prevent stressors in your life! Some ideas I recommend: prioritize and schedule physical activity in your week, eat regularly, and get the sleep you need to function at your best. (For people in their teens an ideal sleep schedule requires 9 hours of each night.) Sacrificing sleep for marks does not always work. If you miss some sleep a nap may be necessary. Eating a nutritious diet is also important. You can’t eat too many vegetables and fruits and you do need protein, especially if you do not eat meat. Healthy eating will help prevent weight gain. Food choice is not just a financial decision. It is helpful, and economical, to bring healthy snacks to campus. Be in control of substance use. Binge drinking and other drugs have huge consequences on mental and physical health. You can drink moderately and still get work done. Caffeine and other drugs, such as cannabis, also require discipline by creating limits because substances can impair your ability to think. In fact, discipline in everything you do will produce improved quality of life. Heavy drug use can impact your achievements in school, sport, health, friends, and money. Remember to put school first because you are paying to be here! Be aware of the economics of your lifestyle, including food, travel, social costs, tuition, books and tutors. Know your budget and stay within it. If you do acquire mental illness symptoms while at university, like I did, get the help you need. Symptoms of anxiety and depression are common to all students. If your symptoms persist beyond two weeks and it begins to impair your ability to function then you may need to seek professional help. Serious mental illness can first show up during young adulthood. This is more likely to occur if you have substance abuse and other unhealthy habits in your lifestyle. If serious mental illness occurs, you can still be successful at university. Mental illness may, in some cases, require professional help, reduced course load, or taking a break from school to get back on your feet. Your likelihood of succeeding as a student is greater if you seek the help and support you need. There is no shame in reducing course load and taking your time to be successful. <strong>Where do you go for help?</strong> Start with your peers. There are peer services available. Ask your friends for direction. Speak with your family. A difficult time is easier with family support. Discuss academic progress with Academic Advisors. 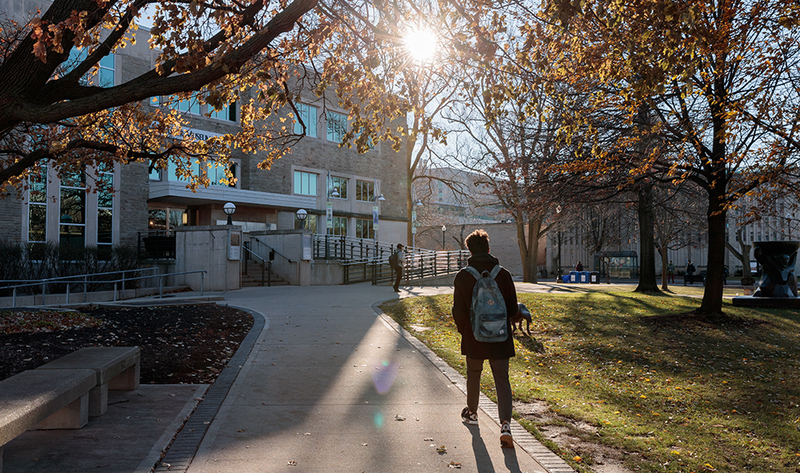 Accommodations through <a href="https://sas.mcmaster.ca">Student Accessibility Services</a> may be indicated. Seek self-help guidance by using call lines and reliable websites. <a href="https://wellness.mcmaster.ca">wellness.mcmaster.ca</a> Find professional counselling or see your doctor. This is the gateway to more specialized care.